A few weeks ago, I posted a piece on where individuals spammers were located in terms of sending IP. The United States was number 1, followed by China. This is in terms of total volume of spam that they send. However, a second piece of data that I did not take a look at was where all of the individual spam sites contained within the spam was located. For example, does a lot of spam sent from the United States point to spammy URLs hosted in China? I decided to do a preliminary investigation and find out. I took a random sample of the past 4 days of 500 URLs from a URL reputation list. All of these URLs had to hit our filters (i.e., greater than zero hits) and get past our IP blocks. I took the number of individual spam hits per URL, and I then mapped the URL back to its A-record. I then converted the A-record to its country of origin. In other words, I did URL → A-record → Country. I then got the distribution of the proportion of IPs hosted in each country, and then the proportion of spam mail containing a URL hosted to each country. 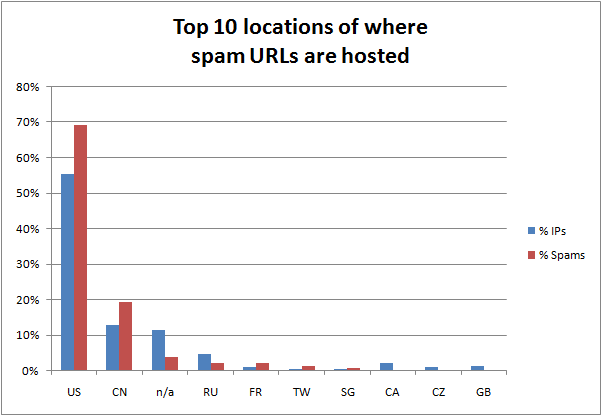 To interpret the above chart, out of all the unique IPs mapped back from URLs found in spam, 55% were located in the United States. However, 69% of the total spam messages contained spam URLs on hosts located in the US. In other words, the US has a disproportionate amount of spam pointing to servers located within its borders. While China may have a greater total of URLs registered to it, the fact is that our content filters are seeing way more spam to web sites located in the US. In the above chart, the "n/a" column refers to sites that I couldn't get an A-record for. Perhaps the site has been taken down, or maybe moved on. But it definitely had a big chunk of spam hits. If you are interested in what domains are getting hit the most and where they are located, the results are below. I have normalized the data to show relative frequency of how often a site gets hit using the 16th most frequent URL as the baseline. The United States simply contains a lot of URLs that are spammed a lot and that is why they take up so much spam in the world of spam. The US sends the most spam and it hosts the most spam in this limited sample set. This confirms what we see above, a few sites can dominate the spam volumes and skew the statistics. And a domain resolving to an IP in China now will suddenly resolve to somewhere in Brazil within the next minute or two (or whenever the TTL expires). So that's not a usable metric. Do what I suggested last time - check whois for the domain registrar, and for the contact information in the whois record. You'll get a rather more accurate metric than what you've posted here. That does not look like fastflux to me. With a one hour TTL, that does not look like fastflux either. That's a Jewish charity or religious movement or something. Probably got hacked. Then 100freemb.com is a free webhost, snurl is a link redirection / short url service .. pretty mixed bag, that. The spammer could be anywhere. Local Time: Friday, April 19, 2019 11:23 PM PDT – Page Load: 0.3275 Sec.